Region: United States, Washington D.C.
Untitled Gin No. 2 is the second gin in One Eight Distilling’s line of aged gins. We previously reviewed Untitled Gin No. 1, and we quite enjoyed it. Different from No. 1, Untitled Gin No. 2 is rested in both ex-bourbon barrels and new American oak barrels. New oak is unusual with aged gins, and it likely is to reason for the wide color different between the 2. Untitled Gin No. 2 is a deep amber golden, with a hint of umber radiating from the liquid inside. It has a color that is closer to a light whiskey than many of the aged gins on the market. The experimentation is in the aging, the botanical blend seems to be the same with the unusual spicebush once again making an appearance. Much more pronounced on the nose than its predecessor, the nose has thick notes of wood, pine and oak planks, and vanilla kissed licorice. You’ll notice, side-by-side this one is definitely more punchy. Even though this Untitled Gin No. 2 is 1% ABV lower than Untitled Gin No. 1 this one packs a lot more heat on the palate. Orange and vibrant citrus, especially mid-palate, the citrus recedes a bit into a more tangerine-like sweetness in the background, while juniper and pink peppercorn stir on the edge of the throat, just as crisp notes of dry oak and buttery lemon cake fade to black. Exceptionally long finish, with spicebush and peppery dry oak notes linger. This is fantastic to simple sip neat or on the rocks, but I like its predecessor, think that Untitled Gin No. 2 is great in an Old Fashioned, with cherry bitters or black walnut bitters if you have them handy. But to put it simply, this is a sipping spirit more than a cocktail spirit. Bartenders will find a lot of flavor here to work with if their willing to be creative; however, I think that Untitled Gin No. 2 is probably best suited for life as a sipping gin. The flavor is beautiful and I also recommend this gin. 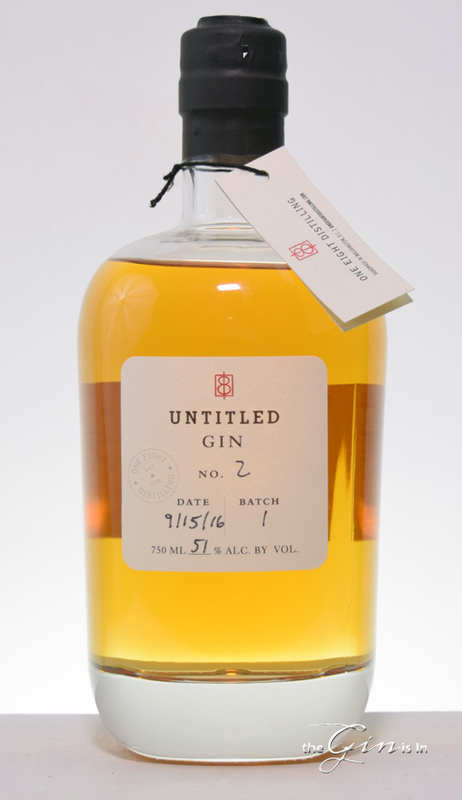 But if you’re on the fence: if you want a more subtle, vanilla tinged aged gin that’s smoother and more confident in its shoes, go with Untitled Gin No. 1. If you want a brazen, spice and wood forward aged gin that brings with it more oak and more citrus, go with Untitled Gin No. 2. The folks at One Eight Distilling are doing some find work with their aged gins. No. 2 is more than just a second attempt, it’s a vastly different experience. And one that I also think aged gin drinkers will enjoy.